The Apple Sisters are back with a special mailroom episode dedicated to the fans! Join Candy, Cora, and Seedy Apple as they answer important listener questions regarding Jesus, Cora’s Pieshow, pirate booty, and much more! 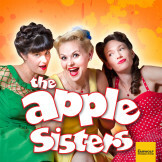 To pick up a copy of their new album, 1943, visit TheAppleSisters.com.